Through the existence of ring species, scientists can say with 100 percent certainty that small differences can accumulate in nature to the point that two populations of the same species can become reproductively isolated. They can actually go out and see it. I Subspecies: A group within a particular species that shares genetic characters with other group members that it doesn't share with members of the larger species. Subspecies may interbreed quite freely or may be partially reproductively isolated — that is, they can interbreed but don't do it as well, or produce offspring as viable, as when they mate within their own subspecies group. Subspecies can range from ever-so-slightly-different groups within a species to groups that are on the verge of speciating. I Race: Used most often to describe variation within the human species. Human races are differentiated primarily by skin color, but even though the genes responsible for skin color are noticeable, the actual genetic differences among races are slight. In fact, skin color doesn't accurately reflect the genetic differences among humans. Two people of African descent could easily be more genetically different from each other than a person of European descent may be from a person of Asian descent. Bottom line: Races have slight differences, and these differences are no where near the level they'd have to be to decrease gene exchange. I Breed: Domestic animals (such as dogs and cows) whose characteristics are artificially selected and maintained by humans through animal husbandry are divided into breeds. The goal of selective breeding is to create animals that differ from their wild counterparts and possess relatively predictable traits. Take dogs, for example. Humans have been breeding dogs for only a relatively short period, and over that time, starting with wolves, we've managed to produce everything from Chihuahuas to Great Danes. All breeds of dogs are the same species. They can all interbreed, although admittedly, interbreeding is easier for some pairs than for others. Note: Standard convention gives species names to products of animal husbandry. That doesn't mean, however, that dogs and wolves are different species (in fact they share the same species name: canis domesticus). Dogs and wolves can still interbreed, even though a "happily ever after" probably wouldn't be in the cards for the Big Bad Wolf and your Pomeranian. 1 Their habitat surrounds an area of hostile environment that they can't cross. Think about a bird species living in the lower elevations around the Himalayan mountain plateau. 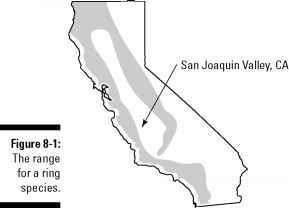 Or a little salamander living around the edges of California Central Valley. Or a bird that lives on the land masses surrounding the Arctic ice cap. They can move around the edges, but they can't cross over the middle, where they wouldn't be able to survive. Figure 8-1 shows a habitat for a ring species. i Neighboring subpopulations around the circle, or ring, are slightly genetically different from each other. These genetic differences can be measured. Maybe there's been selection for different alleles in different places; maybe the genetic differences are the result of drift; maybe both. i Most neighboring populations can interbreed with each other. The populations near one another are a little different genetically, but they are still the same species and can therefore mate and produce viable offspring. 1 At one place around the ring — the ends — the neighboring populations can't interbreed with each other. Each population can breed with its neighbors (because neighboring populations are just a little bit different), yet all those differences add up as you go from one end of the ring to the other. The result is that, by the time you've gone all the way around from the beginning of the circle to the end, the two populations on the ends are too different to interbreed. If it wasn't for all the populations in the middle, the two end populations would be different species. Think of the ring as a horse shoe with the ends bent together so they touch. 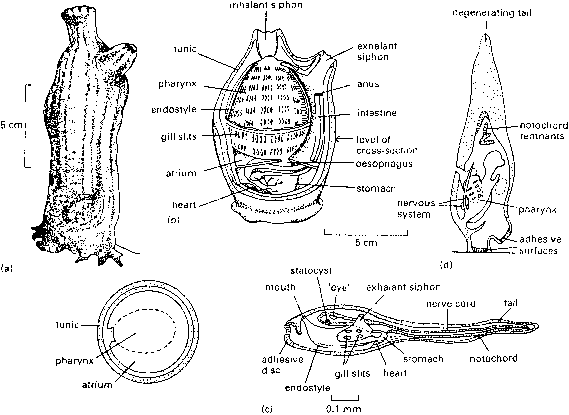 The two populations at the ends of the horse shoe are just too different to interbreed. You can still think of populations comprising a ring species as being part of the same species because they share a common gene pool, and their genes can be combined via the intermediate populations (so they're not completely reproductively isolated), but obviously, this is a gray area because the populations at the ends of the range can't interbreed. 1 Any event that wipes out the populations in the middle (such as an epidemic or uncontrolled hunting). 1 Reduction in gene flow (the exchange of genes between adjacent, or nearby populations): The mating and reproduction that go on within a species does a pretty effective job of keeping all the genes between populations mixed and, therefore, keeping these populations genetically homogenous. As long as the genes can be easily exchanged between populations, the two populations can't diverge genetically. Mating keeps mixing the genes back together. For speciation to occur there needs to be a reduction in gene flow. Once populations aren't being mixed together, they can become more dissimilar as a consequence of the different evolutionary trajectories experienced by the two populations. Reproductive isolation can happen via two mechanisms. • The accumulation of differences can, by itself, lead to a reduction in the ability to interbreed. The different populations are just too different. • When the populations have diverged to the extent that the offspring of such matings are less fit, natural selection acts to prevent mating between individuals of the two populations. If individuals from the two populations can still interbreed but with reduced success, natural selection will favor individuals that say, "I'm just not that into you." Matings that won't produce quality offspring aren't good for fitness — alleles for avoiding such mistakes will increase as a result of selection. Numerous events can bring about reduction in gene flow, decrease in similarities among populations, and their eventual reproductive isolation. Sometimes, these events are physical barriers; other times, they're not. By studying naturally occurring variation, scientists have discovered that some of this variation can be accounted for by organisms having adapted to their local environment. Think about it: Some species have ranges that extend over areas so large that environmental factors differ from place to place within the species' range. A species of flowering plant, for example, can have a range that extends from Texas to Minnesota, and given the very different conditions in the two areas, it shouldn't come as a surprise that plants in Texas and Minnesota would flower at different times. These differences often have a genetic basis; natural selection has favored alleles for flowering earlier in Texas and later in Minnesota. If you're a flowering plant, you want to flower at the same time that your neighbors are flowering, because mating is hard if your flowers are the only ones that are open. For that reason, flowering time, which is crucial to a plant's fitness, is under strong selection. A plant that flowers too early may lose its flowers to a late frost; one that flowers too late may lack sufficient time to produce seeds before winter comes. A fair number of plants self-pollinate — information that is of absolutely no value in this discussion except as a little bit of trivia. Mull it over at your leisure. One of the tricks plants use to make sure that they flower at the right time is to assess day length — a perfect predictor of the time of year regardless of where you are. The "right" day-night cycle for flowering, though, depends on where the plant grows. By taking sample plants of a species from different places across the entire species range and growing them under controlled conditions in a greenhouse where day length can be varied, scientists have found that the various populations of plants have adapted to respond to the different day-night cycles of their respective original locations, even though they all belong to the same species. Although plants with different light-dark cycles can interbreed, they generally don't, for the simple reason that the plants that are most different are likely to be ones that are farthest away, and Minnesota pollen has little chance of landing on a Texas flower. Because gene flow, gene exchange between adjacent populations, is low to non-existent over such long distances, plants in different parts of this large area can evolve different combinations of genes. By growing the plants from different locations in a controlled environment, scientists were able to show that some populations in the same species are adapted to the local conditions where they were found. Speciation occurs when the separate populations become reproductively isolated, losing their ability to produce live or fertile offspring. The mechanisms responsible for reproductive incompatibility fall into two categories: prezygotic isolating mechanisms and postzygotic isolating mechanisms. 1 Prezygotic isolating mechanisms: Specifically, prezygotic refers to those things that occur before the egg is fertilized. Basically, this type of isolating mechanism stops sperm and egg from getting together. 1 Postzygotic isolating mechanisms: Postzygotic isolating mechanisms are those that occur after the egg is fertilized. They don't stop mating, but they stop the offspring from being viable or able to reproduce. The following sections go into more detail. 1 Reproductive timing differences: Hey, when the time isn't right, what can you do? 1 Spatial separation: If one population is always on hawthorn trees, and the other is on apple trees, never the twain shall meet. 1 Mate-choice specificity: Basically, this situation is the evolution of being picky. 1 Physical incompatibilities between the two sexes: This mechanism is common among insects. Have you ever seen Drosophila genitalia? Let me just say this: If the pieces don't fit, you really must quit. 1 Inability of the sperm and egg to fuse: No fusing means no offspring. Postzygotic isolating mechanisms are those that come into play even though individuals from the two diverging groups do mate. As a result of different evolutionary trajectories, the parents are different enough that they don't produce fertile offspring (or any offspring, perhaps). Postzygotic isolating mechanisms include l Spontaneous abortion of hybrid embryos: The offspring are never born. I Low offspring viability: The offspring die, often before reproducing. Postzygotic isolating mechanisms drive the evolution of prezygotic isolating mechanisms. Why? Because mating with someone you can't produce viable offspring with is a bad idea, and natural selection favors genes connected with correct mate choice. The ring species example is all we need to be sure that the process of speciation can happen. There's nothing magical about: Little differences add up until you get a big difference. But most species don't have a ring-shaped distributions, so while ring species provide an excellent example of the nuts and bolts of the process, that's not how we usually imagine the speciation happening. In allopatric speciation, a physical barrier separates the populations and limits or eliminates gene flow between them. Any physical barrier that reduces gene flow will do: a mountain range, a patch of unsuitable habitat that's difficult to cross, or an ocean. Allopatric speciation is considered to be the most important speciation mechanism — lots of examples occur in nature — and also the easiest to understand. It just stands to reason that a reduction in gene flow will occur when populations are physically separated, and you can easily see how species can become separated: continents drift apart; mountain ranges rise; climates change and alter the availability of suitable habitat. Although scientists can't experimentally witness the process of speciation from beginning to end because of the long time periods involved for full speciation to occur, they can find pairs of populations at every stage of the process, from recently physically separated and not very divergent all the way through very divergent and not very able to reproduce. Allopatric speciation by founder effect, like allopatric speciation (explained in the preceding section), requires that the two populations be isolated physically. The difference is that in founder effect speciation, the second population originates from a small group of individuals separating from the main group, such as a flock of birds being blown to an island. 1 Genetic drift: The founding population already starts off a little differently genetically and thus by chance may have gene combinations that predispose it to a different evolutionary future. This process may be helped by genetic drift in the small initial population. For the details on genetic drift, go to Chapter 6. 1 Natural selection: When a population is in a novel environment, genetic differences accumulate as a result of natural selection. Differences in predators, prey, or other food resources could drive natural selection in different directions compared with the mainland population. In parapatric speciation, the two populations aren't physically separated; instead, they abut each other. Because they're within mating distance, something other than a physical barrier must be causing the reduction in gene flow between these populations. That impediment? Natural selection. Suppose that a species' range encompasses two adjacent environments with conditions different enough that genes advantageous on one side aren't advantageous on the other. As a consequence, natural selection favors particular traits on one side that it doesn't favor on the other side. If an individual from one side meanders over to the other side for a little procreation, his offspring with his genes from the "bad" side will be selected against. As a result, the usual homogenizing effect of mating between individuals of two habitats will be reduced or eliminated, and the two populations will become more divergent. A classic example of the first stages of parapatric population divergence is the evolution of plants in areas contaminated with mine waste such as heavy metals. These areas aren't ideal places to set up house, but some plants can. In these hostile environments, natural selection favors genes that allow plants to survive high concentrations of lead and other metals. In the absence of this contamination, these genes aren't necessarily favored. 1 They have evolved different flowering times from the original population. Different flowering times prevent gene flow across the mine waste. The difference in flowering times is most pronounced at the border between the two environments, because plants that are farther from the mine waste are less likely to receive pollen from mine-waste plants and, therefore, are less likely to experience a selective force favoring different flowering time. • It prevents the production of offspring with low fitness by preventing matings with plants from uncontaminated soil. • It comes in handy if getting pollen from another compatible plant is difficult. ¿jtjW^ In parapatric speciation, selection is strong enough to reduce the likelihood that genes from one environment will make it in the gene pool of a population living in a different environment. Further evolution of reproductive characters (like different flowering times, for example) decreases gene flow between populations even more. In the mine-waste example, the two populations are adjacent, and pollen blows back and forth, yet the offspring that result from matings between the two populations are not likely to contribute their genes to the next generation. Different selective regimes in the two environments have resulted in a reduction in gene flow between the two populations, which will only increase the degree to which the two populations diverge. Sympatric speciation occurs without the organisms in the two populations being physically separated at all. No physical barrier prevents gene flow (as in allopatric or allopatric speciation by founder effect speciation), and no spatial discontinuity exists (as in parapatric speciation). In sympatric speciation, it is some detail of the environment that results in a reduction of gene flow between the two populations. Suppose that one particular combination of genes makes some individuals better at foraging at night, and another combination generates individuals that are better at foraging during the day. If some of the individuals are active only at night and others are active only during the day, the night-active critters are more likely to breed with other night-active critters, simply because those are the creatures they interact with. Although researchers suspect that sympatric speciation is unlikely to be a very common speciation mechanism, evidence suggests that the process can be important occasionally. A possible example is the case of the apple maggot worm — a pest of apples in the United States. Apples aren't native to the United States; they were introduced by European settlers. The apple maggot worm, on the other hand, is native to the United States. Before the introduction of apples, it fed on hawthorns, and many maggot worms still feed on hawthorns. Hawthorns and apples can grow in similar locations. The apple worms that infest apple trees have ample opportunity to mate with worms from hawthorns and produce offspring, but when scientists examine them, they see that the apple worms infesting one type of tree are genetically different from those feeding on the other type of tree. Something's preventing gene flow between these two types of worms. Even though apples and hawthorns exist in the same environment, for some reason the flies that lay eggs on one species avoid laying eggs on the other. One possible answer involves ripening times. Apples ripen earlier than hawthorn fruits, and the flies living on the different species reproduce at slightly different times. More interesting, the flies seem to have developed a preference for either apples or hawthorns. The flies laying eggs on apples have a preference for apples, whereas the flies laying eggs on hawthorns have a preference for hawthorns — preferences that must have evolved after the introduction of apples to the United States, arising in a location where apples and hawthorns coexist. It's this feeding preference that's driving the flies' divergence. Speciation hasn't occurred for the apple maggot flies yet. The two populations can still reproduce (even though doing so would be the entomological equivalent of a Capulet-Montague pairing), but they're beginning to diverge genetically even though they live in exactly the same place, as close to each other as neighboring trees. As two populations diverge, they can become reproductively isolated. Populations living in different environments experience different selective pressures. As a result, they become genetically different and less able to reproduce. In this case, reproductive isolation is a by-product of selection. Alternatively, reproductive isolation can be selected for when two populations have diverged to the point where hybrids have lower fitness. In that case, any mutations that result in the organisms' wanting to avoid "interbreeding" will increase in frequency. Diane Dodd designed an experiment in which several generations of fruit flies were raised on different kinds of food: either a starch-based food or a sugar maltose-based food. Starting with a single population of flies, the researchers produced different fly lineages. The initial flies were the same, and the experiment was set up in such a way that the only selective pressure was the food type. Flies that did well on maltose (or starch) were more likely to leave more descendants and hence their genes were more likely to end up in the next maltose (or starch) generation. After 8 generations, Dodd conducted experiments to investigate the mating preferences of the evolved flies. To conduct these experiments, Dodd introduced male and female flies from the different populations into a cage and kept track of which flies got together. When the flies came from different populations that had been fed the same food, they didn't exhibit a preference for mating with flies from their own population. A fly raised on starch was just as likely to mate with a fly raised on starch from a different population as it was to mate with a fly raised on starch from its own population. The same results held for flies raised on maltose: They didn't exhibit a preference for their own population compared with others raised on similar food. When the experiment involved flies that had been fed different food types, however, the situation changed. In this case, the flies exhibited a distinct preference for mating with flies that had been raised on the same food they had. What's important about this experiment is that in producing the flies, Dodd didn't select for reproductive preferences; she selected for increased fitness on one type of fly food or another. But as a result of evolutionary changes for increased fitness, the flies also developed changes in mating preference! This experiment clearly indicates that selection for fitness in different environments may result in reduced ability to interbreed.